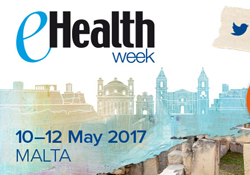 For the first time, WHO/Europe is joining the team creating the programme for eHealth week, which will be held in Malta on 10–12 May 2017. The Maltese Ministry for Health is organizing the event as part of the Maltese Presidency of the Council of the European Union, together with the European Commission and HIMSS–CHIME International, a partnership of the Healthcare Information and Management Systems Society and the College of Health Information Management Executives. The theme for eHealth Week 2017 – “Data for health: the key to personalized sustainable care” – will highlight the impact that data has on patients’ health. eHealth Week gathers stakeholders from across the globe to address the opportunities and challenges of using electronic means to deliver information, resources and services related to health. The conference and exhibition provide a platform for high-level decision-makers in fields such as public health, health care and information technology to share valuable knowledge and exchange solutions.